There’s beauty in every season, and I love photographing gardens in the winter. Admittedly, the cold weather, combined with the fact that most of the flowers and foliage have gone, can be uninviting. However, unless you’re a fair-weather photographer, it’s well worth venturing out on winter days as the season offers many photographic opportunities. The soft, low-contrast light we get on overcast days may not be dramatic, but it gives good, accurate colour rendition. On clear, cold winter days we get crisp and relatively low-angled sunlight, which is great for backlighting subjects and emphasising texture. Also, as sunrise comes much later in the morning, you don’t have to get up at an unearthly hour for the early light. The vivid colours of summer are replaced by the more pastel shades of winter, but I enjoy working with such a muted colour range. I also relish the opportunity to shoot using frost, snow and mist, as each of those weather conditions brings a distinctive atmosphere and offers a fresh perspective on familiar subjects. If you feel your own garden is offering little inspiration, try exploring any local public gardens that are open in the winter. Formal gardens look wonderful when shrouded in mist, encrusted with frost or dusted with snow. Even a light dusting of snow transforms gardens completely and I always shoot as much as I can in snowy conditions. 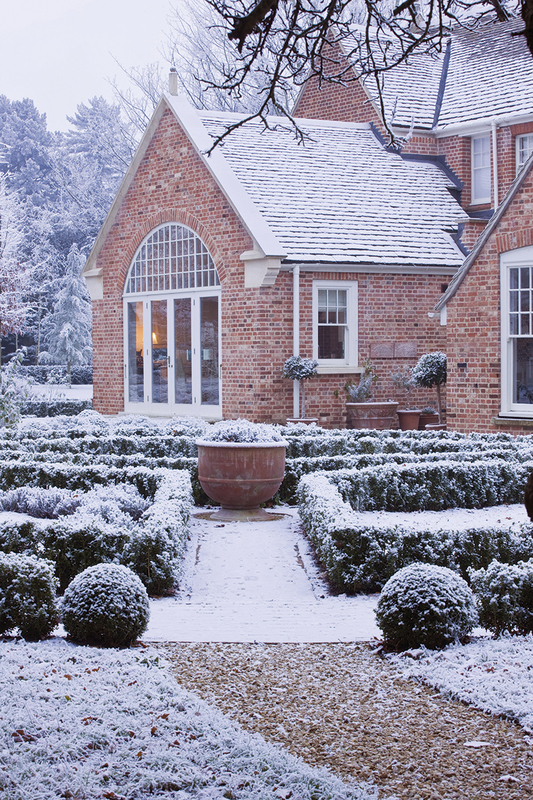 Snow emphasises the shapes in features such as box hedges in formal gardens. It also makes pale colours – such as those in the house and foreground path in this picture – stand out against the almost monochrome surroundings. If you’re shooting snow scenes in bright sunlight, always bear in mind that camera lightmeters can be fooled into underexposing, so you should overexpose slightly to compensate. 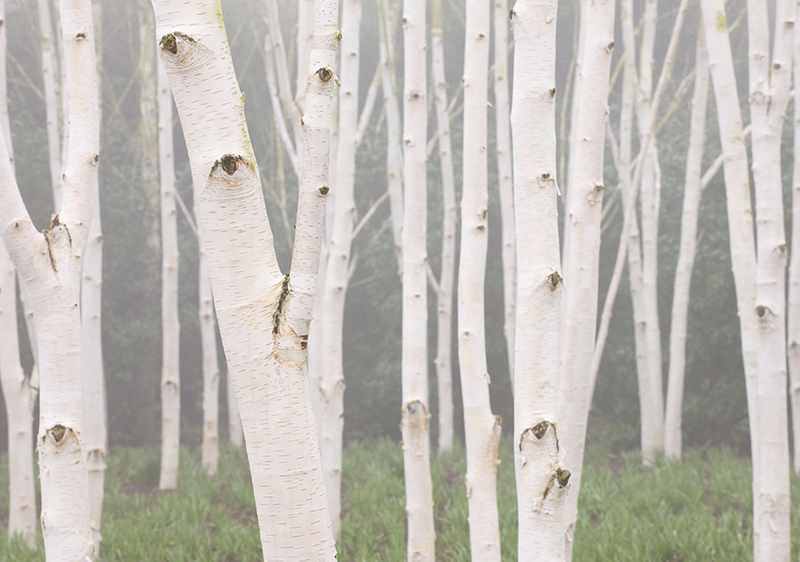 The muted light we get on misty mornings lends subjects a mysterious, almost ethereal quality. In this case, it adds a special atmosphere to this grove of birch trees, which I photographed at Anglesey Abbey in Cambridgeshire. The ghostly trees, which seem to have eyes, have been scrubbed to look pristine. I chose to fill the frame with them and used f/16 on my 70-200mm zoom to keep as many in focus as possible. Frost is great for both wider garden scenes and close-ups of individual plants. In the case of this macro shot of an Araucaria araucana – or monkey puzzle tree – frost has isolated and accentuated its spiky shapes. I chose to focus on this section to emphasise the symmetry of the shapes, while using f/16 on my 180mm macro lens to give as much depth of field as possible. At the post-capture stage, I took out the original colour, then duotoned the image to give it a cool, almost metallic appearance. Some shrubs, such as cornus, are grown for their rich winter colours, and warm, late-afternoon light is ideal for emphasising their red, orange and brown hues. I photographed these stems at the RHS Garden at Wisley in Surrey, in January. Instead of shooting a wider scene, I used the long end of my 70-200mm zoom to select a small area where the colour was most concentrated. The curve of the bank, plus the reflected colour in the water, make an attractive composition. 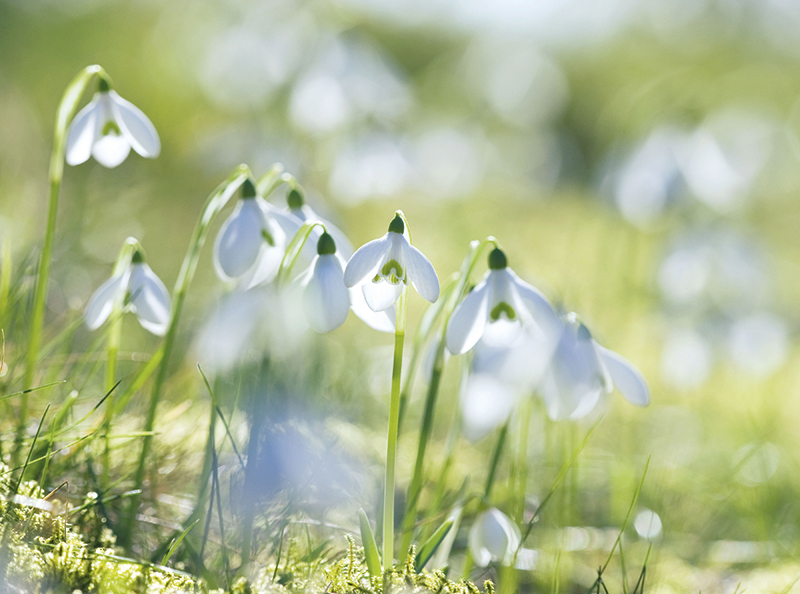 Snowdrops start appearing in January and make great subjects, either indoors as a still-life subject or in the field. When photographing them in groups, I like to use a shallow depth of field and pick out one or two for sharp focus, while blurring others in the foreground and background. To shoot these, I put my coat on the ground and lay on it, looking in the direction of the sun. As the snowdrops were strongly backlit, I overexposed by a couple of stops. If you have the opportunity to shoot in a historic garden, look out for any unique architectural features that are transformed by the winter conditions. Details such as this sundial, shot in Wollerton Old Hall Garden in Shropshire, can make great pictures. 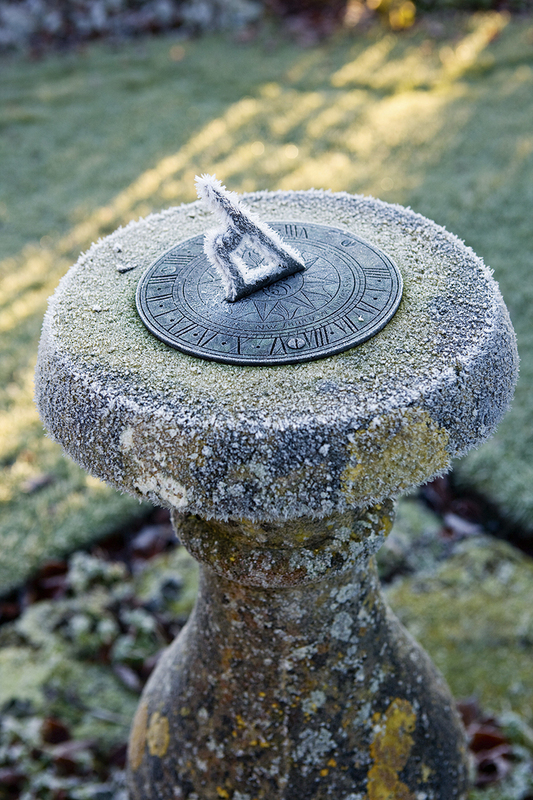 Here, the thick layer of frost combines with the patina of age on the sundial. I shot it very simply by looking down on it with a wideangle lens. The patch of low winter sunlight on the grass behind adds another attractive dimension to the picture. On a clear winter’s day, you can shoot in low, raking sunlight at around 8am instead of 5am in the summer. It’s great for backlighting garden subjects. In this case, I’ve used the long shadows from the bare silver birch trees to give depth to the scene. Although I was shooting straight into the sun, I avoided flare by using the trees to block and diffuse the sunlight. I also overexposed by a couple of stops to ensure detail was retained in the trees.